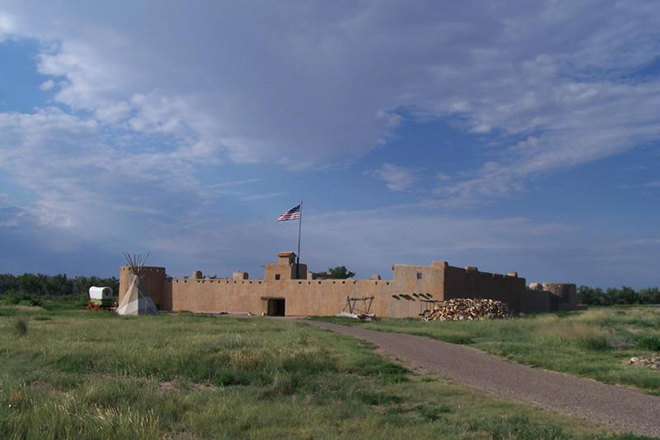 Saturday, June 11th, the Bent's Fort Chapter of the Santa Fe Trail Association will tour several historic sites in Southeast Colorado. The tour will start at the Star School at 9:00 AM. The Star School is located about 3 miles west of Colorado Beef (junction of Hwys 50 and 287) or 10 miles east of Hasty. Watch out for traffic if you are coming from the west. West bound traffic is hard to see at the school. After learning about the history and reconstruction of the school we will travel to Bent's New Fort. From there we will cross the Arkansas River and stop at Amache Studios. The next stop will be the ruts south of McClave Junction followed by going to the site of the Caddoa Indian Agency. The agency is a foot print now. We should arrive about 12:30 for lunch at the John Martin Reservoir Welcome Center and the Army Corps of Engineers Museum. There are also additional Santa Fe Trail ruts to see at the Reservoir. If you plan to attend, bring whatever you need to eat and drink for the day. Dress for the weather -- hats and sun screen are advisable. Low clearance vehicles are not a good idea as at least half of our tour will be on dirt roads. If you have any questions contact Pat Palmer at 719-931-4323 or by email at gpatpalmer@hotmail.com.